"El Chepe" is the nickname for the Chihuahua al Pacifico Railway line that runs through Mexico's Copper Canyon, between Los Mochis, Sinaloa, and Chihuahua, the capital of the state of Chihuahua. The train runs daily through the spectacular scenery of La Barranca del Cobre. 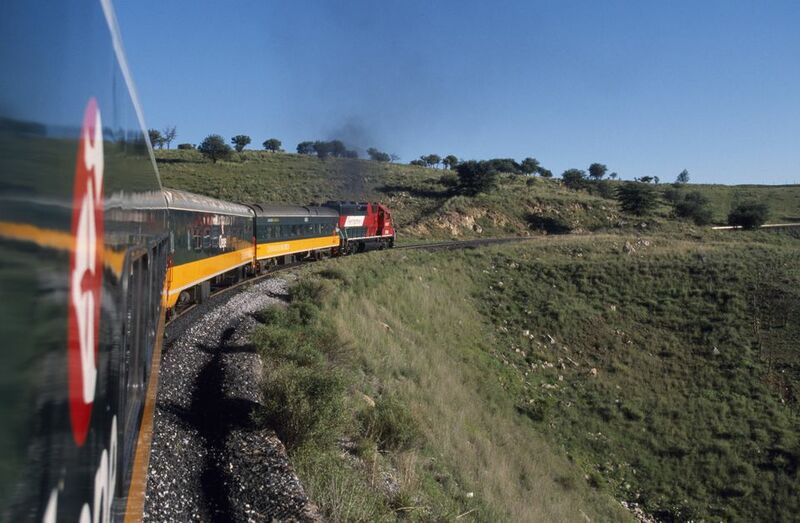 This is the last remaining long-distance passenger train in service in Mexico and makes for a very memorable trip. Construction on the Copper Canyon railway line began in 1898. The engineering feats required to span the area were beyond the technology of the time and the project was abandoned for several years. Construction was renewed in 1953 and completed eight years later. El Chepe railway line was privatized in 1998, and taken over by Ferromex, a private rail company. The entire journey from Los Mochis to Chihuahua city takes about 16 hours. The railway covers over 400 miles, climbs 8000 feet into the Sierra Tarahumara, passes over 36 bridges and through 87 tunnels. During the trip, the train passes through a variety of ecosystems, from desert to coniferous forest. The train stops for passenger boarding and deboarding at the following stations: Cuauhtémoc, Creel, Divisadero, Posada Barrancas, Bahuichivo/Cerocahui, Témoris, El Fuerte and Los Mochis. There is a 15 to 20 minute stop in Divisadero to enjoy the view of the canyon and to purchase handicrafts from the local Tarahumara people. Many travelers choose to get off the train in Divisadero or Creel to explore the canyon and enjoy the adventure activities on offer and board again the following day or a few days later to continue the journey. There are two classes of service, Primera Express (First Class) and Clase Económica (Economy Class). The First Class train departs Los Mochis daily at 6 a.m. and the Economy Class train departs an hour later. The main difference between the two classes is the comfort and spacing of the seats, and the Economy Class train makes more stops - stopping at any of fifty stations along the route at passengers' request. The First Class train has 2 or 3 passenger cars with 64 seats each, and a dining car with meals and bar service. The Economy Class has 3 or 4 passenger cars with 68 seats in each car, and a "snack car" with fast food available. All the cars in both classes have air conditioning and heating system, reclining seats and ecological toilets. Every car has a porter to attend to the passengers. Smoking is prohibited on El Chepe. During most of the year, you can purchase tickets at the train station on the day prior to traveling, or on the morning of your departure. If you are traveling around the Christmas or Semana Santa (Easter) holiday, it is advisable to book in advance. Visit the Copper Canyon Railway official website for more information.